In the old fishing harbor of Vueltas located on La Gomera, an island in the Canary Islands, sting rays, eagle rays and Butterfly rays regularly come to visit the port. Over the centuries, fishermen in the harbor have thrown their bycatch into the port by the landing stairs, which has lead to the rays foraging there. 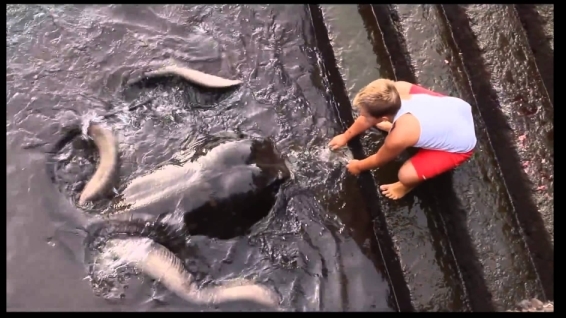 In this video, a boy named Joel, befriends a very large sting ray who swims right up to the stairs and lets him pet him, while getting a snack! La Gomera is one of Spain's Canary Islands, located in the Atlantic Ocean off the coast of Africa. In area, it is the second-smallest of the seven main islands of this group. It belongs to the province of Santa Cruz de Tenerife. Its capital is San Sebastián de La Gomera, where the headquarters of the Cabildo are located. In 2011, mantas became strictly protected in international waters because of their inclusion in the Convention on Migratory Species of Wild Animals. Responses to "Boy and Friendly Manta Ray Develop Unlikely Friendship "
i've seen this several times but skipped due to yet more hysterical headlines; thanks for not bothering with those! still, guys, which is it, a manta or a stringray? my daughter was hugged by a manta in tahiti (i think) and she was so happy, said it was a wonderful feeling. I wouldn't exactly call that friendly. It was looking for food and seeing how the boy was a bit leery shows I am right,.